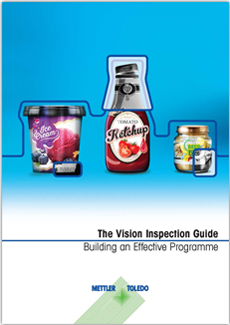 The Vision Inspection Guide provides a complete reference to vision inspection technology for use in the food and pharmaceutical industries. The guide covers everything from the different types of vision inspection systems available and how they work, to key design features and how to sustain an effective vision inspection programme. The 7-chapters provide an insight into all aspects of the technology. Increase product quality without sacrificing production speeds. METTLER TOLEDO's Vision Inspection systems are designed to inspect product labels across all market segments and packeging types, with flexibility to perform additional formation and integrity checks.